Earlier this year, Google began using site speed, or load time, as a search ranking factor, claiming that “faster sites create happy users.” Since the search engine’s professed goal is to give users what they want, it makes sense that load time would enter into the ranking algorithm. Even if you didn’t care about your Google ranking (not likely! ), improving your blog’s loading time would be a good idea. Sites that load quickly are more user-friendly and tend to have more user engagement, meaning visitors stick around to view multiple pages. In other words, making your blog faster can lower your bounce rate. And the longer visitors stay on your site, the more likely they are to convert. So if you want high rankings and happy, returning users, you need to make sure that your site runs speedily, and the same goes for your blog. Here are five tips to keep your blog running quickly. As an added benefit, these tips will reduce your bandwidth and can even lower your hosting costs. • Host your own images: By hosting images on your own servers, you eliminate the need for your site to contact other servers. • Delete unnecessary images: Unless they are thumbnail images, try to limit the number of pictures in each post to two or three. These will break up the text and add visual interest without causing undue lag time. • Reduce the size of your images: Experts recommend that you set your photo sizes to 800 by 600 pixels or smaller. • Don’t duplicate files for the same image: If you use the same image more than once, refer to the same file—because your browser’s cache has saved the information about the file, the image will load faster. Using CSS (Cascading Style Sheets) instead of HTML tables on your blog (and site-wide) will give you simpler source code, which promises faster load times. It’s also easier to make style/design changes after the fact. A CSS optimizer, such as the Code Beautifier (available free online), can help you simplify your CSS code, eliminating white space and unnecessary characters, converting text to lowercase and making other adjustments that will help your site load more quickly. •	Animations: Animations and moving ads can add seconds to your blog’s load time. Make sure the amusement is worth the trade off before including an animation. •	Widgets: Widgets are small applications that run on your site, like a Twitter feed. Because they access other servers, they can slow down your blog. Be selective about what widgets you add. If you use shared hosting for your blog, you might want to look into switching to dedicated or grid hosting, as shared hosting can slow down load times when the demands on the shared server are high. Dedicated hosting gives your blog or site its own dedicated server. With grid hosting, your resources are spread across multiple servers. Dedicated hosting is generally the priciest option. It’s a good idea to download a Firefox add-on for analysis of your blog’s performance as well as suggestions for speeding it up. Try Google’s open source add-on Page Speed, which tests your server configuration and front-end code and offers tips on load time optimization. There are also a number of WordPress plug-ins to reduce load time. In addition to helping your blog rank higher in organic search results, these tips can help you in the pay-per-click advertising arena as well—landing page load time is a factor in the calculation of your AdWords Quality Score. Elisa Gabbert is the Senior Content Development Manager at WordStream Inc., a provider of Internet Marketing Software, which includes a set of advanced SEO tools for discovering profitable long tail keywords. 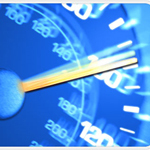 I have also looked into site caching to speed up my site. It works really well once your blog is up and running but if you are making a lot of little changes in the early stages of your blog it can be frustrating refreshing the cache for each change. You can simply tun it off when you are making changes though. I think the plugin I use is WP-sitechache or something with a similar name! Host your own images – one of the best advice. I believe images, lots of it, is a major factor that can really slow down webpage loading. Tips to optimize images for faster loading is valuable information for bloggers who likes to dress up their blogs with images. Very concise and great tips regarding load time improvement.If you are using wordpress then you can easily tweak your load timing but it is very difficult to optimize it in blogspot blogs because they do make so many external css and java script file linking and http requests.If you want complete control on your blog performance then opt for wordpress or any php based blogging platform. Great tips. You can have good content, but if your blog loads slow your organic search results will be low.